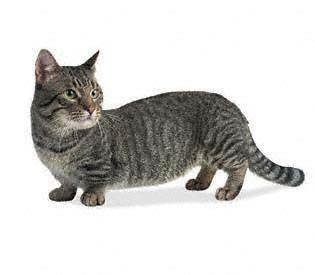 People think that the Munchkin cat breed is a new mutation, but this is not true. Dr HE Williams-Jones wrote in a British veterinary report in 1944 about four generations of short-legged cats. One of these cats was an 8 year old female whose mother, grandmother and offspring were all similar in appearance and all were very healthy and active. Sadly, this line was lost during WWII. However, in 1956 in Stalingrad, in 1970 in New England and in the 1980’s in Louisiana the short-legged trait was seen again. Sandra Hockenedel found a pregnant short-legged cat in 1983 – this miniature cat became the foundation for the Munchkin cat breed we know today. This cat was called Blackberry and Sandra gave one of Blackberry’s offspring to a friend. From these two cats the Munchkin breed was established by out-crossing with domestic cats to diversify the gene pool. In September 1994, the Munchkin was accepted into the New Breed development program by TICA. This program is used to monitor the breeding statistics under the supervision of the Genetics Committee. 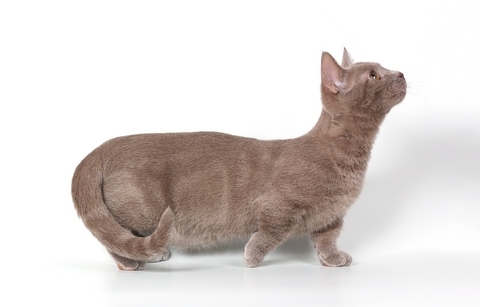 Data showed that the short-legged mutation followed a dominant pattern of inheritance (the same as the Corgi and Dachshund dog breeds) and in May 2003, TICA granted championship status to the Munchkin cat breed. The Munchkin cat breed is a small to medium sized cat weighing between 5-9 pounds when fully grown. Only their short legs make the Munchkin cat look different to any other normal cat. A natural mutation shortening the leg bones is responsible for the short legs. In the Munchkin the spine is different from that of a short-legged dog such as a Corgi and therefore this miniature cat breed does not suffer from the same kind of spinal problems associated with dog breeds with the same mutation. Munchkins can be either short haired or long haired and are available in every pattern and color you can think of. The variety of patterns and colors are due to the out-crossing that maintains the breed’s genetic diversity. Long haired Munchkins have an all-weather coat that is silky to the touch. Grooming is required twice a week to ensure that the coat stays tangle free and shiny. Short haired Munchkins have an all-weather coat that is plush and only require a brushing once a week to keep the coat in top condition. The Munchkin is a playful, sociable cat that loves games that involve lots of running and chasing. No, you did not misread. Even though these cats have short legs, this does not deter them from running around in a mad dash after a toy. Some people say that a Munchkin in action looks like a little radio-controlled car zooming around. These miniature cats love children and other pets – even dogs. They are very curious and will investigate everything and anything. Although they might not be able to jump from the floor to the top of a cupboard, they will be sure to find a route that will include a few smaller jumps to reach their destination.